A 1-1 draw against Fulham for our opening game of the season with a superb goal from Fowler, the usual near misses and some encouraging performances. Probably the best news of the weekend though was that Shaun Wright-Phillips has agreed contract terms and signed up for another 4 years with us; he was also rewarded with a call up for the 24-strong England squad in this week’s friendly. We have match views tonight thanks to Rich, Mike and Ernie, opinion and the usual requests. A new season but the same old script! As with so many games last year this was a tale of two halves. City dominated the first half and had the lion’s share of the possession yet didn’t really carve out a great number of chances. Bosvelt was enforcing the midfield really effectively, Reyna was allowed time and space to pick out some nice through balls and both Sibby and SWeeP were busy on the wings providing outlets, yet we seemed to have little cutting edge or final product. Fowler’s goal was a striker’s gem, a looping volley with his back turned to goal. The first half finished with a fine move from Fowler latching onto a long clearance and back-heeling for Anelka who blazed high and wide. In the second half Fulham came out more searching for an equaliser, I was particularly impressed with Bouba Diop who I thought completely ran the midfield in the second half for Fulham. But like City in the first, Fulham were enjoying lots of possession without causing us too much concern. Suddenly a ball played to the wide left saw Distin chase and lose possession, the ball was immediately pumped back into the middle (exposing the space left by Distin and leaving Dunne marking two attackers). The cross fell to Collins John who seemed to mis-control, which appeared to wrong-foot Dunne and James and then he managed to shoot into the bottom left hand corner to equalise. At this point the game opened up with a number of chances for City (particular Sibierski) and Fulham (Legwinski thwarted by a class save from James), however you felt if anyone was to sneak a win then it would have been the visitors. In all 1-1 was a fair result but I couldn’t help but feel a little gutted that we hadn’t taken all three points (starting the season at CoMS on the right foot). James 7 – Had very little to do but was alert when he needed to be and made a corking save when caught 1 on 1 with Legwinski. Dunne 8 – Superb display by Dunne-Monster, commanding in the air, cool on the ground and reasonable distribution; if he continues this form he’ll get a lot of admirers. Since January he has been class. Quite rightly Man of the Match. Distin 7 – Good all round display, great in the air and starting to form a good partnership with Dunne. Partly responsible for the Fulham goal. Mills 6 – Reasonable début, nice to see him really wind up the opposing supporters and looks like he’d run through brick walls. Distribution poor at times, hence the lower mark. Sibierski 7 – Played left midfield and was a bit of a square peg in a round hole, however Sibby didn’t stop running and chasing. Prepared to have a shot and also went close with a couple of headers. Spoilt performance with a couple of bad passes but given he was out of position I thought the lad did well and was encouraging. Reyna 6 – Had a great first half where he played just behind Fowler and Anelka and was threading some nice balls and linking midfield/attack really well, Anonymous second half. Bosvelt 6 – Superb first half, broke up play and held the holding rôle magnificently. Seemed to tire in the second half and was replaced by Barton. SWeeP 7 – Just gets better and better, seems to be picking out the right ball every time and crossing is getting better as well. I think SWeeP is going to have a corking season. Best of luck for Wednesday! Quieter in the second half. Fowler 7 – Worked really hard for the side. Superb instinctive strike, showed some nice touches and even linked with Anelka on a few occasions. Anelka 6 – Wasn’t on fire today but had some nice touches and tracked back. Not sure why he’s taking the corners, much prefer him to be on the end of them! Barton 6 – Fetched and carried but didn’t seem to have a great impact on the game. Macken 5 – Pretty much ineffective. M Messias 5 – Reasonable performance but the amount of times he blew in favour of defenders on high balls was ridiculous (however, watching the Chelsea vs. U**ted game today, Poll seemed to be doing the same so maybe there’s been some sort of directive). Despite not collecting all 3 points I’m upbeat. Thatcher and Mills I believe are good acquisitions; first and foremost they are defenders, they also have a bit of pace (not lightning) and don’t shirk challenges. This to me is a big plus on last season when we had Tarnat’s inability to go forward and slowness and Sun’s defensive naïvete at times cost us badly. Hopefully both will help us shore up the defence. Dunne and Distin are starting to form a good partnership. The midfield is still a concern; first half they were excellent yet the second half we were much less effective and quickly ran out of ideas. The Fowler and Anelka partnership showed signs of life but we cannot afford to persevere with it like last season. If it doesn’t work then we need to revert to Fowler/Macken or Anelka/Wanchope or even a 4-5-1 system (certainly for away games). I can’t help but think the next 5 games will really shape our season. I decided while reading some of the summer moaning that instead of getting frustrated at what I read and hear, I should contribute more often. My prediction was one of total uncertainty before this game; certainly on paper we have better players than Fulham, but last year they stifled us tactically and we became frustrated. Secretly I thought a 2-0 home triumph. My wife and I stayed in Manchester the night before and lo and behold, there was Chris Coleman with an entourage of coaching staff in the bar; we did not get the opportunity to spike any drinks! Saturday morning, very excited the pair of us. We got to the ground nice and early and had a look round some of the bits we did not explore last season. Saw a very gloomy looking Eddie Large and then Tommy Docherty looking very excited at the prospect of seeing a really top Manchester side. City started well, confident passing, but again Fulham set out to frustrate, with 2 sat in front of a back 4, and just one up front. Other people will doubtless be sending their detailed analyses so I shall refrain. We shone in the first half and a little less rustiness would have seen us score more than Robbie’s fine overhead effort. Anelka and Wright-Phillips looked real quality. Bosvelt and Reyna played OK but struggled to break the opposition down; we should have used the flanks more. The new full backs both looked very good defensively but we lacked the attacking understanding that Jihai Sun shares with SWP. Fulham capitalized on a little defensive uncertainty to equalize. I guess we should have won but we could have lost but for England’s number 1! Why oh why did we resort to pumping long balls upfield second half, when the most notable things about Fulham’s defenders were their physical presence and height advantage?! And why do we stop giving the ball to SWP despite his tendency to embarrass his marker? Fulham were well organized but City looked the better of the two sides and we felt reasonably satisfied as we headed back to York. More so as I avoided getting a speeding ticket to go with the one I collected heading home after the Lazio game! Liverpool will be tough, as ever, can we hope to escape with a light defeat but then a point at Birmingham with a thumping home win over Charlton to follow? City did enough in the first half to have won this game, Van der Sar in the Fulham goal made some spectacular saves. I was impressed by Reyna’s performance; his distribution of the ball was very good. Growler took his goal very well, and worked hard for the cause, he showed disappointment at being taken off, and hope that it will not affect the confidence that he has got back. Anelka ran all over the field and we saw some nice touches, but I am baffled why he takes all the corner kicks; nothing wrong with the kicks, but as a striker I would prefer to see him in the box with his ability to score. How about Reyna taking the corners? It was a positive performance from City, with newcomers Danny Mills and Ben Thatcher having good games, Dunne was a star in central defence and kept Andy Cole under wraps, Distin played better in defence, but when going forward lost concentration giving the ball to Fulham; he has got to keep his concentration, a bad trait from last season. A game we deserved to have won, Fulham must have gone home feeling very lucky getting a point. Great attacking Keegan style of play, just need to get the ball into the back of the net more, it will happen. Next game will be a real test in Liverpool. Funny how the mind works; when my eyes caught the phrase “Blues snap up Simpson” in MCIVTA 1041 I immediately thought of Homer. Sad. Watched extended highlights of City on Sky on Saturday night but there must have been a technical fault and they showed a replay of one of last season’s games. I mean, after 30 or so games we learned that playing Fowler and Anelka together meant that we wouldn’t convert possession and general superiority into goals, didn’t we? No criticism of either intended; it just seems an empirical fact. OPINION: IS IT ALL OVER? Well, the first Saturday of the season is over and the Rags are firmly entrenched third from the bottom. Obviously Ferguson’s off seasons manoeuvering hasn’t brought the desired result as they’ve registered a paltry 0 points so far and languish with the likes of Southampton and Charlton already facing the prospect of a return to the Nationwide League. In reply to Nigel Gibson’s comment in MCIVTA 1043 that City fans are the friendliest, this is without a very true statement. I have just moved over to Ireland and with renewing my season ticket I was hoping to meet like-minded people like myself, who like nothing more than a few beers, a bet and watch the Blues triumph. Well the in-laws came over to see us so we decided to take them to Dublin for the weekend (the father in law is a dirty Red from, yep, Kent). So after Friday and Saturday night on the Guinness the females wanted to go shopping on the Sunday. I needed a bottle or two of lucozade so popped into a very small newsagents, where a local was reading a football magazine. Still being a little worse for wear ,I struck up a conversation. Long story short, he had just got his 1st season ticket, which happens to be near my seat. 20 minutes later with the women fuming and a bored father in law we arranged to meet up for a drink or two over what I hope will be an enjoyable season. Keep the faith and continue being the best supporters in the land. Keith, you really are ‘avin a laff ain’t ya mate? And as for asking our neighbours? I never compare my beloved MCFC to them! Things could be worse, a lot worse! But I do question some of the signings, lack of signings, contract negotiations and tactics. Sorry if that offends you. Let’s get behind the lads and manager in any case on Saturday (loud chanting!) and hope for the best this season. If you read what I said, I did request that they make me eat my words! It’s only a game, isn’t it? Suffolk based Blue and King’s Lynn branch member, making a 448 mile round trip to each home game, I was very disappointed today to find that the ticket store has sold out for the Liverpool away game next Saturday, as I am in Liverpool that weekend and was hoping to get tickets for myself and my lad who is 8 years old. Is there any chance that anyone has any Liverpool tickets going spare? I am looking for 1 adult and 1 child, but happy to take 2 adult tickets if available. Please call 07973 614371 or email. I have a spare for the Birmingham game at the rip off price of £40, face value! Ring: 07812 065005 or email. I am going to be around Perpignan, Andorra and Pyrennes when we play Liverpool, Birmingham and Charlton. Anybody out there who may know if any of our games are going to be shown and where? Deadlines for issues are nominally 6pm, Monday and Thursday evenings bu email. Unfortunately we cannot accept email attachments. Manchester City FC recognises three supporters’ clubs: The “Official Supporters Club” ( http://www.mancity.net/osc/ ); the “Centenary Supporters’ Association” ( http://www.reddishblues.com/CSAWebsite/CSA.htm ) and “The International Supporters’ Club” ( http://www.mcfc.co.uk/article.asp?article=111845&Title=International+Supporters+Club&lid=Membership ). The GMR pre and post match phone-in is available on the web at http://www.bbc.co.uk/england/gmr/sport_intro.shtml . 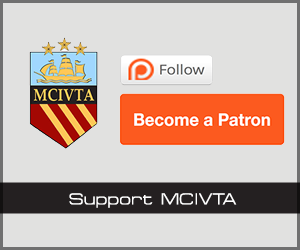 Live match commentaries and archives of games, reports and interviews can be found at http://www.mcfctv.com/ . http://www.satfootball.com/pl.html provides a listing of Premiership games being shown on UK domestic and foreign satellite channels. Useful sites for North American viewers are http://canadatvsoccer.tripod.com/Fixtures.htm , http://www.foxsportsworld.com/named/FSW/Index/Soccer , and http://www.soccertv.com/ . Can I buy shares in the club? Yes you can: Shares in Manchester City PLC are traded on OFEX. The latest prices can be on found the OFEX web site http://www.ofex.com/ (registration required) or in the business section of the Manchester Evening News. 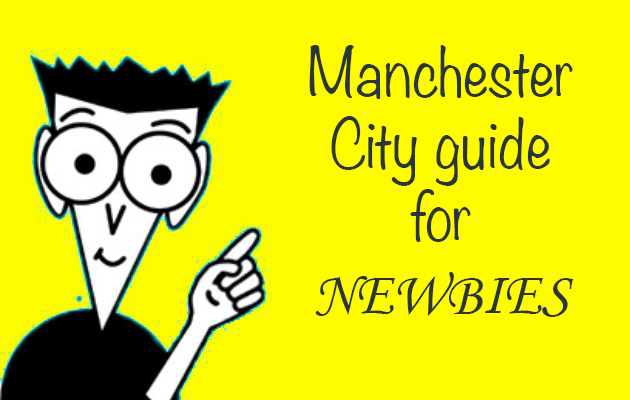 Where can I find a list of City-related websites?